Facebook is finally begin ing to show green after losing billions amid an ongoing data scandal. Shares of Facebook gained more than 4%, breaching $US160, on Thursday as Wall Street eyes a turnaround for the embattled social media stock amid the ongoing Cambridge Analytica data scandal. 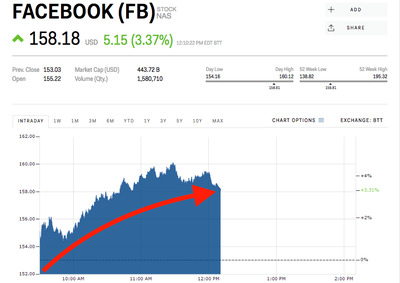 Facebook has received a number of new buy ratings from Wall Street analysts this week, who now have an average price target of $US220 – 38% above where shares were trading Thursday. Before today, the stock had lost as much as 20% since news of the company’s practices with data brokers like Cambridge Analytica first broke. Now, however, Wall Street sees a potential buying opportunity. Reporting from Business Insider’s Tanya Dua confirms SunTrust’s thesis that advertisers are sticking with the embattled social network, despite the fiasco. Roughly a dozen prominent ad media buyers told Business Insider that none of their clients are planning to cut spending on Facebook in light of the mishap. Other price targets are as high as $US260, according to analysts polled by Bloomberg, despite remaining questions around potential regulation and testimonies from Facebook executives in front of both US and UK lawmakers. Shares of Facebook are down 12% since the start of the year.